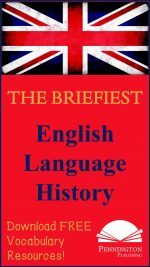 The English sound-spelling system is a reliable system for writing the sounds of the English language. True, there are plenty of exceptions, but applying the rules and adjusting for exceptions is certainly better than memorizing every word as a unique entity. Imagine having to memorize each of the Chinese characters to be able to write simple communications and most will agree that the alphabetic system serves us well. The English sound-spelling system works in about 50% of spellings. You can be a pessimist and see the glass as being half-empty or an optimist and see the glass as being half-full. I prefer the latter. The basic problem-solving strategy in spelling should not be memorizing the spellings of all words. Instead, the speller should first attempt the spellings that match the sounds of the word. After all, spelling is an auditory, not a visual process. If there is not a sound-spelling match, knowledge of spelling rules and mastery of sight-spellings should be secondary strategies. The common sound-spellings are listed on colorful animal cards and may be downloaded free at Animal Sound-Spelling Cards. Have your students memorize and practice the spellings on those animal cards that the Diagnostic Spelling Assessment indicates as diagnostic deficits. Check out Spelling Games for some terrific activities to practice these spellings. 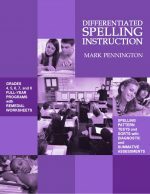 Preview the Grades 4-8 Spelling Scope and Sequence tied to the author’s comprehensive grades 4-8 Language Strand programs. The instructional scope and sequence includes grammar, usage, mechanics, spelling, and vocabulary. Teachers and district personnel are authorized to print and share this planning tool, with proper credit and/or citation. Why reinvent the wheel? Also check out my articles on Grammar Scope and Sequence, Mechanics Scope and Sequence, and Vocabulary Scope and Sequence. 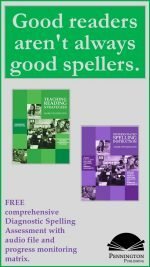 FREE DOWNLOAD TO ASSESS THE QUALITY OF PENNINGTON PUBLISHING SPELLING RESOURCES. 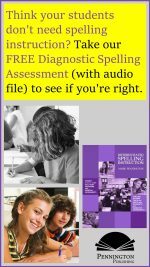 Administer my FREE comprehensive Diagnostic Spelling Assessment with audio file and recording matrix. It has 102 words (I did say comprehensive) and covers all common spelling patterns and conventional spelling rules. It only takes 22 minutes and includes an audio file with test administration instructions. Once you see the gaps in your middle school students spelling patterns, you’re going to want to fill those gaps. weekly spelling pattern tests and accompanying spelling sort worksheets (L.2), 56 language application opener worksheets (L.3), and 56 vocabulary worksheets with multiple-meaning words, Greek and Latin word parts, figures of speech, word relationships with context clue practice, connotations, and four square academic language practice (L.4, 5, and 6). Comprehensive biweekly unit tests measure recognition, understanding, and application of all language components. The program also has the resources to meet the needs of diverse learners. 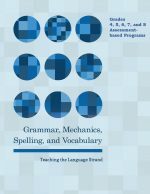 Diagnostic grammar, usage, mechanics, and spelling assessments provide the data to enable teachers to individualize instruction with targeted worksheets. Each remedial worksheet (over 200 per program) includes independent practice and a brief formative assessment. Students CATCH Up on previous unmastered Standards while they KEEP UP with current grade-level Standards. Check out the YouTube introductory video of the author’s program. Developing a weekly spelling-vocabulary plan that differentiates instruction for all of your students is a challenging task for even the best veteran teacher. Teachers truly want to differentiate spelling instruction, but the materials, testing, instruction, and management can prove overwhelming to even the most conscientious professional. Using this Spelling Program Checklist can help teachers re-focus to improve their spelling instruction. □ I administer, score, analyze, and differentiate spelling instruction according to a comprehensive assessment which diagnoses sound-spelling strengths and weaknesses. □ I administer, score, analyze, and differentiate spelling instruction according to a comprehensive assessment which diagnoses sight-syllable strengths and weaknesses. □ I administer, score, analyze, and differentiate spelling instruction according to a comprehensive assessment which diagnoses non-phonetic “outlaw word” strengths and weaknesses. □ I administer, score, analyze, and differentiate spelling instruction according to a comprehensive assessment which diagnoses high frequency words strengths and weaknesses. □ I know exactly what Rafael’s spelling deficits are, according to diagnostic data. □ I have an instructional plan in place to remediate Rafael’s deficits. □ I pull aside groups of remedial spellers that share a common spelling deficit for practice and spelling dictations regarding that spelling deficit at least twice per week. □ I have formative assessments in place to analyze Rafael’s progress. □ Beyond the grade level spelling curricula, I know exactly what Kenny’s spelling deficits are, according to diagnostic data. □ I have an instructional plan in place to remediate Kenny’s deficits. □ I assign advanced spelling practice for accelerated spellers like Kenny. □ I have formative assessments in place to analyze Kenny’s progress. □ I use the spelling pretest as a diagnostic test and differentiate instruction from that data. □ My spelling pretest has clear sound-spelling or syllable-spelling patterns and I analyze diagnostic data according to these patterns. □ My spelling posttests are all individualized because they are designed according to the diagnostic data of the spelling pretest and other diagnostic assessments. □ My spelling posttest includes words that students have misspelled in their own writing. □ My spelling posttest includes words that student have misspelled on their last spelling posttest. □ My spelling posttest includes non-phonetic “outlaw words” that are unknown to the students according to diagnostic data. □ My spelling posttest includes conventional spelling rules. □ I give my students different spelling practice, according to their diagnostic strengths and deficits. □ I teach parents (elementary school) how to help their students practice their spelling. □ I have students practice their spelling deficits in the context of real writing. □ I teach students how to memorize spelling words for the spelling posttest. □ I teach students how to use mnemonic devices to memorize difficult spelling words. □ I teach students the most-useful eight conventional spelling rules. □ I have students memorize the most-useful eight conventional spelling rules. □ I have students practice the most-useful eight conventional spelling rules. □ I hold students accountable for correctly spelling words in their own writing that follow already-introduced spelling rules. □ I have a plan in place to hold students accountable for correctly spelling already tested words in their daily writing. □ I mark spelling errors in student writing, according to the abilities of the individual student and hold students accountable for correcting, practicing, and applying words that I mark. □ Students keep track of unknown or challenging spelling words that they use in their writing. □ I teach spelling editing skills in the context of authentic writing tasks. □ I integrate spelling and vocabulary by using derivational spellings. □ I integrate spelling and vocabulary by using etymological spellings. □ I integrate spelling and vocabulary by using homophone (sounds the same, but spelled differently) spellings. □ I integrate spelling and vocabulary by using homograph (spelled the same, but sounded differently) spellings. □ I integrate spelling and vocabulary by using Greek and Latin prefixes, suffixes, and roots. □ I show how the phonics rules and help inform spelling decisions. □ I teach students that spelling is an auditory skill, and not a visual one. □ I teach phonics rules to those who demonstrate diagnostic deficits. □ I teach structural analysis skills, including syllable rules and accent placement. □ I spend at least one hour on spelling-vocabulary word study per week, in addition to vocabulary-in-context reading activities.